Can't shake that cold or flu? Need an extra boost of energy for that upcoming marathon? Had one too many last night? Well first off: you really shouldn't be drinking the night before your big Flu Marathon. But fear not, because Buckhead apothecary Hydration Station is here to cram your wilting, depleted body full of the essential vitamins and fluids you need to feel better. Pitifully stagger into the fluid house and pick your poison remedy from a menu separated into sections for Illness Recovery/Hangover Elimination and Athletic Performance Enhancement. 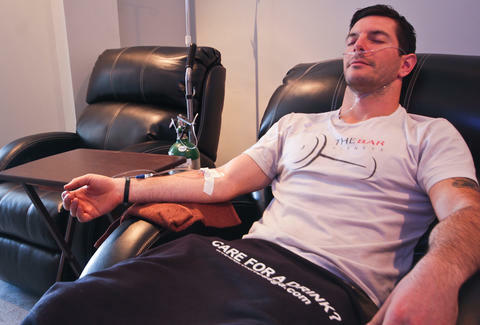 The treatments range from the fluid-heavy Niagara Falls that nets you two liters of life-saving fluid, a B12 shot, 30mins of oxygen (and your choice of nausea or anti-inflammatory meds! ), to the less extreme non-IV stuff that you really shouldn't even consider, because, IVs! 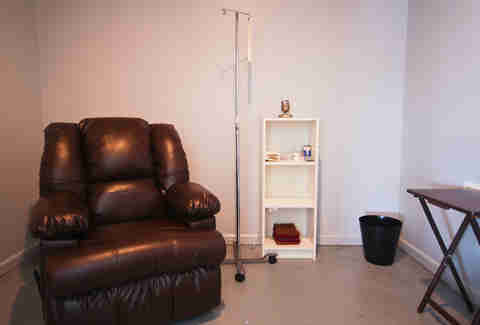 The facility has six private rooms that offer dedicated escapes for your re-hydration experience. Get comfortable in heated leather lounge chairs and veg out to sports on the flat screen. It'll take under an hour to get you back in shape. And just in case you're man enough to drink a ton but not man enough to endure getting pricked by a tiny needle, you can go the non-intravenous route with topical numbing cream, or opt for a la carte stuff like B12 shots and pure oxygen, which, ironically, should help you run your Sickly Man Triathlon without gassing out.